Update August 2016: The cafe has relocated to another place in the same building at The School Jaya One on the ground floor. 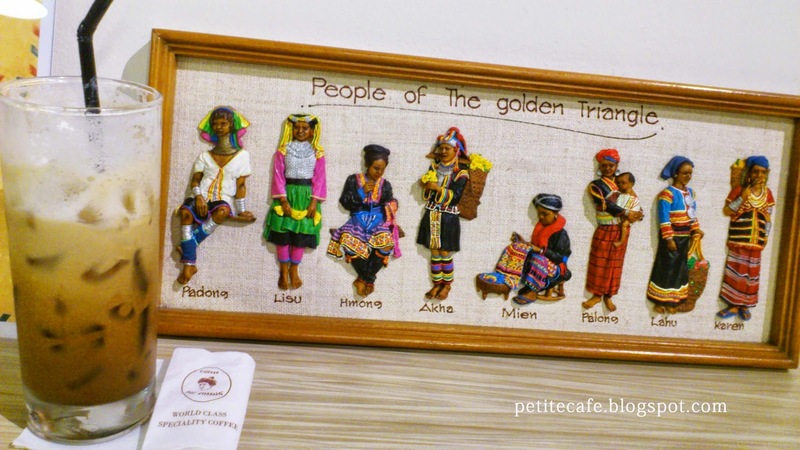 Organic Fair Trade Coffee by the people of the Golden Triangle. Doi Chaang Cafe in Jaya One is a tiny shop tucked between alley at The Retail Lab Project. It's easier to spot the cafe from the 'back' of the shops at the B1 parking which was where I first saw it in my car. I was intrigued when I saw the ethnic name, Doi Chaang, the mascot of an old Asian man and these words, 'Fair Trade Coffee'. Very unlike other cafes. It turned out, Doi Chaang is a single origin Arabica coffee from Thailand! I had the Signature Ice Coffee, upon recommendation by the barista. Not too sweet and as I have requested for less milk, it was also less creamy and I can taste the richness of the coffee. What's interesting about Doi Chaang coffee is the unique partnership between the farmers and the company that market the coffee internationally. The farmers are granted 50% ownership of the company and 100% of the proceed from the sale of their beans! Doi Chaang Coffee is an organic coffee grown in the northern Thailand in the region of the Golden Triangle by the Akha tribes people of the village of Doi Chang (the name of the village is spelt with one 'a'). 20 years ago, under a Thai royal project, farmers started to plant coffee and fruits trees to replace opium plant. However, they have difficulty in selling their coffee beans. Piko Saedoo, an elder in the tribe approached Wicha Promyong for help. The Doi Chaang Coffee Company started when Wicha met Canadian businessman John Darch and the 'Beyond Fair Trade' business model was established.